Explosive theme, damp-squib filmmaking: that, in a nutshell, is the story of Shorgul. Jimmy Sheirgill and Hiten Tejwani’s political drama is a lesson in bad filmmaking! t we suffering enough by the heinous acts of some of our politicians that this botched up misfire inspired by events happened in UP (Uttar Pradesh) by first time helmer Jitendra Tiwari was needed to be bombarded on our senses? 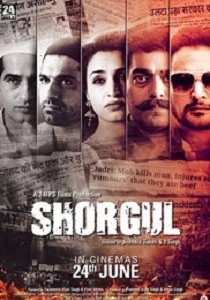 ‘Shorgul’ may be lengthy and chaotic, but its core intention is well meaning and may be watched for what it tries to convey in the existing scenario of communal hatred and intolerance, besides the brilliant performances by Jimmy Shergill and Ashutosh Rana.